Please accept my unworthy, yet loving obeisances at your divine lotus feet. I wish to express my deepest gratitude that in spite of all my anarthas, inabilities and illusions, you continue to love me and accept me as your daughter and disciple. In spite of the complications of life in this earthly world, I continue to remember you daily and think of you with love, and sometimes with painful separation. I pray for those occasional glimpses into the reality of the spiritual world, which is undoubtedly more enduring and more blissful than this world. Very occasionally when those glimpses come, and the window of perception opens-- even for a moment, I am graced with your divine presence and the waves of joy and realization that follow. It is for those moments of transcendence that I live--without them this life would be like dull cardboard, brittle and decaying. Your presence in my life is as essential as my very breath, and as I wrote so many years ago, "Your room was the whole world and you were all the people ... "
Two years ago, you graced me with your presence in a dream. "Govindasi ... " so distinct, just as you called me so many hundreds of times, so many years ago. It was as if you were in the next room. The import was, "come out of this place, come with me ... " And in the next dream scene I was in some sort of aircraft, flying into Mayapur. Then I saw you there, in the distance, walking with some “Dignitaries" -- there were 4 or 5 Dignitaries walking with you, coming across the field behind the Mayapur temple. You were approaching the gateway of a very tall thatched bamboo-like fence. In my dream, I went into the fenced-in waiting area by that gate, a sort of open-air foyer, to await your arrival. There in that waiting area were many old devotees, early disciples who were very dear to you ... all waiting to greet you upon your arrival. I remember seeing Malati dasi, and others from the early era. Many of your oldest disciples were waiting in the entrance way, and our hearts were full of joy! Our beloved Prabhupada was coming back! Then I awoke ... and I wept, feeling your divine presence, and relishing once again the sound of your voice, and the nearness of your presence. I pondered the meaning of the dream, then the pain of separation enveloped me. "See," you said, "this is why I called you to come here, to see my Debut...to see my becoming the center again. And to answer all your tearful prayers ... "
"See, this is why I called you to come here--to see me become the center again .. and to console you and answer all your tearful prayers ...” You smiled as you spoke. "It is necessary to speak the truth, but without anger or malice--even if others have malice, we should not have malice," you instructed. You then said, "Changes are made by those with vision, but it doesn't happen overnight." Again, you said, "Write your book. It is important for the generations to come ... "
“It is simple for the simple hearted, but made complicated by the crooked." 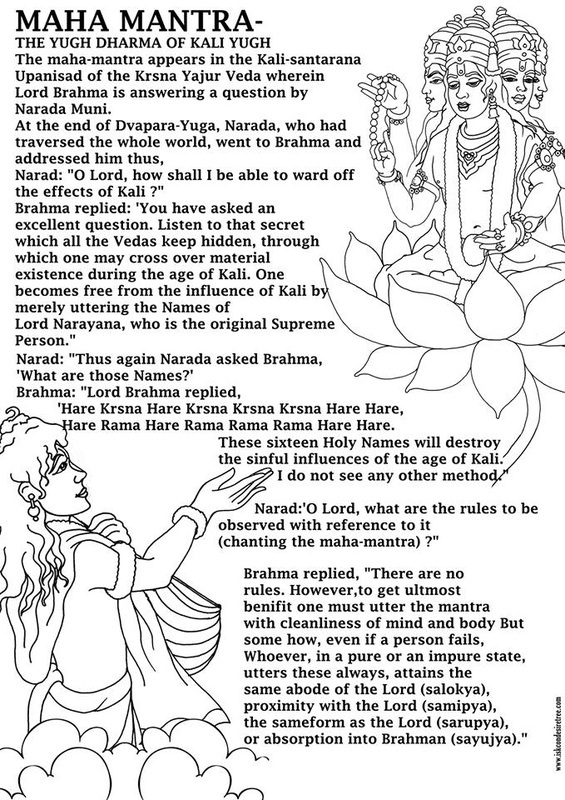 That is, by those who wish to utilize the path of Bhakti for personal gain of name, fame, and greed. Steeped in the joy of Srila Prabhupada's presence, I realized that when we think of a great soul, or of God, Their presence and virtue enter into us. If we light a fire, it will give heat, whether we understand it or not. When we remember Srila Prabhupada, his pure nature covers us in delightful waves. On the other hand, if we think about a person who is impure, we will be enveloped in them and their flaws. The effect is immediate. If we remember great saints, their spiritual power will affect us immediately. If we remember a person with anger, lust or infatuation, then we will experience those things, but when we remember God and Guru these qualities do not arise.